"Half of my job has become managing my outside cleaning service." "All cleaning services start out doing a good job, but very few continue after the first three months." "I have plenty of things to do on a daily basis. The last thing I need is to spend time tracking down our cleaning technicians." Sharp Cleaning Corporation has set up a system to address all your cleaning needs. We manage our cleaning technicians so you don't have to. Our cleaning technicians are motivated to work hard in your facility. We pay our technicians a salary instead of an hourly rate. Cleaning technicians are evaluated on a nightly basis by Sharp Cleaning Corporation's management. Through strict management controls, our technicians can work hard and make a salary equivalent to twice industry standards. The concept is simple: if someone is paid to clean a building on an hourly basis, they will often just go through the motions, take breaks, and do what-ever it takes to get to quitting time. If that same person is paid a salary based on producing a clean facility, whether it takes them eight hours or four hours, the technicians have an incentive to work hard and be more conscientious about their work. After technicians prove themselves with consistently good reports, they are eligible to become building supervisors. Building supervisors can be promoted to become area managers. Area managers can become regional managers, and then regional managers can become assistant managers. The harder people work at Sharp Cleaning Corporation, the faster they advance. This method of promotion cuts turnover dramatically. Often-times the cleaners are in a facility long after the office staff has gone home. 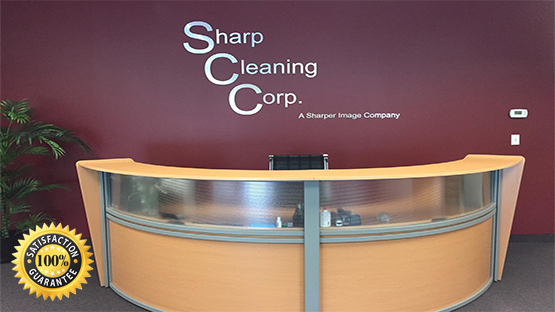 Part of Sharp Cleaning Corporation's hiring process involves reference and background checks. We are usually the only service that visits every square foot of your facility on a nightly basis. If a cleaning technician sees something out of the ordinary, they report it to Sharp Cleaning Corporation management. All of our staff wear-easy-to-identify uniforms and badges. This makes it very easy for your staff to identify ours.